It's a bird, it's a plane, it's a new partnership! For tablet enthusiasts, it's been a Google kind of a day today. We understand. However, if you're a fan of both tablets and dead-tree media – comic books, specifically – then a new bit of news coming out of Barnes and Noble today was all you needed to hear. Barnes and Noble just cemented a partnership with DC Entertainment, which opens up more than 100 different graphic novels for purchase, download, and portable viewing on the Nook Tablet, Nook Color, or Android tablets rocking the Nook for Android application. Superheroes joining the tablet party include titles featuring Batman, Green Lantern, the Justice League, and Wonder Woman. Additionally, a number of iconic graphic novels will join the fray such as Watchmen, The League of Extraordinary Gentlemen, and V for Vendetta, to name a few. "Our goal is to reach the broadest possible audience and this new partnership with Barnes & Noble brings Batman, Superman and many other iconic DC Comics and Vertigo characters to the millions of Nook Tablet and Nook Color readers," said Jim Lee, co-publisher of DC Entertainment, in a press release. But crazy powers, weird villains, and all sorts of men and women flying around in capes aren't the only new elements now arriving on Nook tablets. 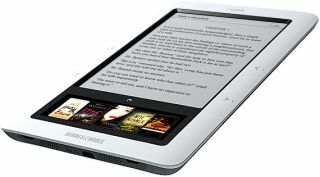 Barnes and Noble also announced a new feature for its Nooks – Zoom View, which allows users to do pretty much exactly what its name implies. According to Barnes and Noble, the comic-centric Zoom View feature will allow users to pull up single panels in graphic novels and comics, "allowing them to fully enjoy the stunning artwork and compelling storytelling that brings this genre to life." "The new Zoom View feature makes the reading experience even more interactive, and takes these graphic novels to a whole new level of entertainment, said Barnes and Noble's Jim Hilt, vice president for eBooks, in a statement. Before users can start tapping into Zoom View - literally - they'll have to update the software on their tablet devices to version 1.4.3. The update's available for download today, although Barnes and Noble has also made it available via a (Wi-Fi-based) over-the-air update for Nook tablets. At least, now, comic book enthusiasts won't have to pick their device by virtue of which of the big franchises – Marvel or DC – it supports. In geek-land, Barnes and Noble has leveled the playing field.